Took a couple of days visit to our country's capital to do a bit of sketching. 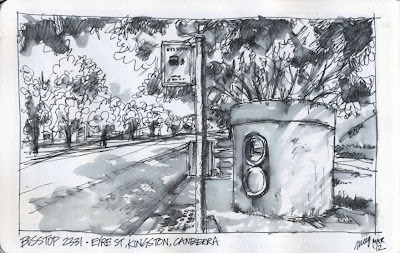 Canberra has so much space and so perfectly planned it is so different from Sydney. It's also a lot greener too which was nice. And incredibly quiet. 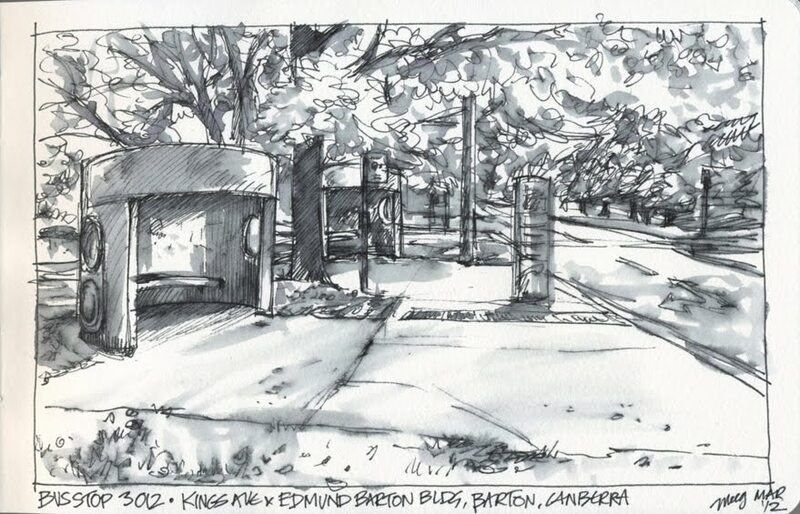 Today I've uploaded my bus stops of Canberra and a few other pieces. Tomorrow I will add some more. These bus stops are out of some 70s science fiction movie, and may have reached iconic status as part of the Canberra urban landscape. 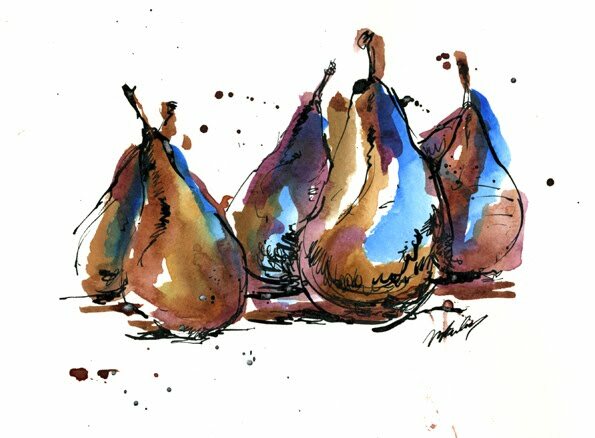 We took the train down, and I found a lovely combination of three inktense pencils (mustard, leaf green and iron grey) that I used in these window thumbnails. 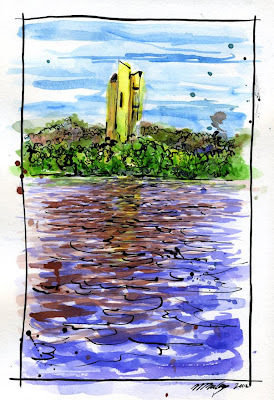 This is the Carillion, a long-time landmark in Canberra. 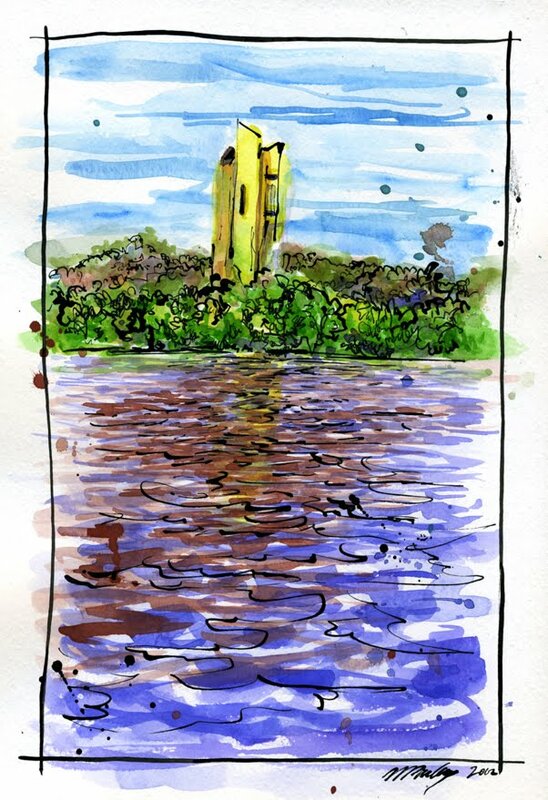 It is a free standing bell tower situated on Lake Burley Griffin. I remember the last time I was there I saw an outdoor performance of a Midsummer Night's Dream. This is a large scale sculpture group of pears outside the National Gallery. It doesn't have the granduer of the glass pyramid at the Louvre, but it is synonymous with the gallery for so many generations.